Office 365 is a cloud-based service, which allows you to access the entire Microsoft Office Suite from anywhere with almost any device. For a monthly subscription fee, you can work remotely on all of your files at the same time as a colleague on the other side of the world, share or update files on the go, and have everything available instantly. 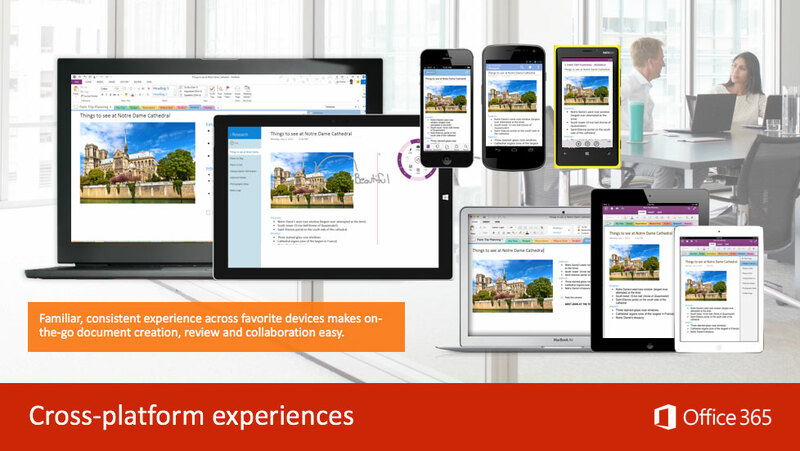 Word, Excel, PowerPoint, Outlook, Publisher and OneNote. So colleagues can access documents, files and data away from the desk. Including Word, Excel and PowerPoint, so you can work on your documents on any computer. With 1 TB storage per user, so you don't run out of space. Transcendit is a Microsoft Gold Accredited Partner, meaning we have the necessary experience and expertise to make your move to Office 365 as beneficial and painless for you as possible. We can set up Office 365, migrate your current systems and maintain your plan for you. Our IT support engineers have comprehensive knowledge of Office 365, and are happy to answer any questions you have on whether it is right for your business.